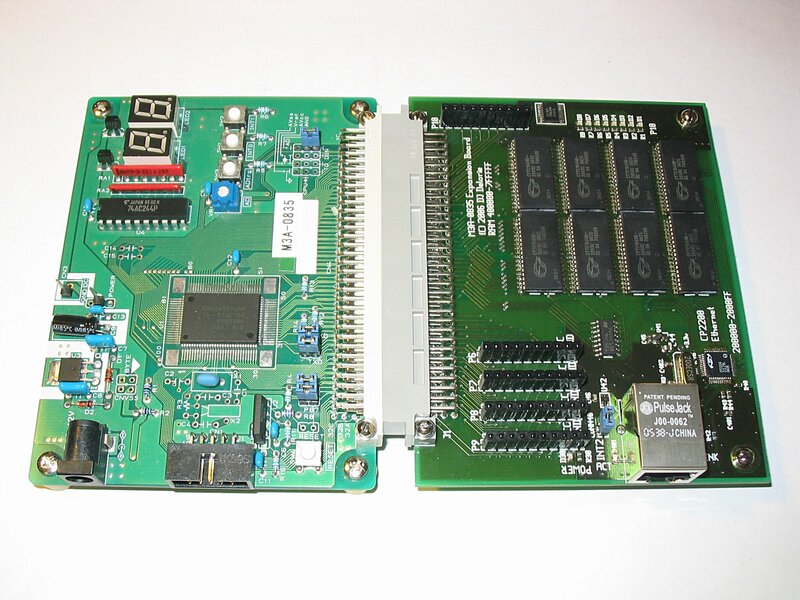 The board on the left is an M3A-0835 starter kit for the M32C/83 MCU. The M32C/83 is a 30MHz 16 bit MCU, which can operate in standalone mode (all pins are I/O) or microprocessor mode (some pins are CPU bus). 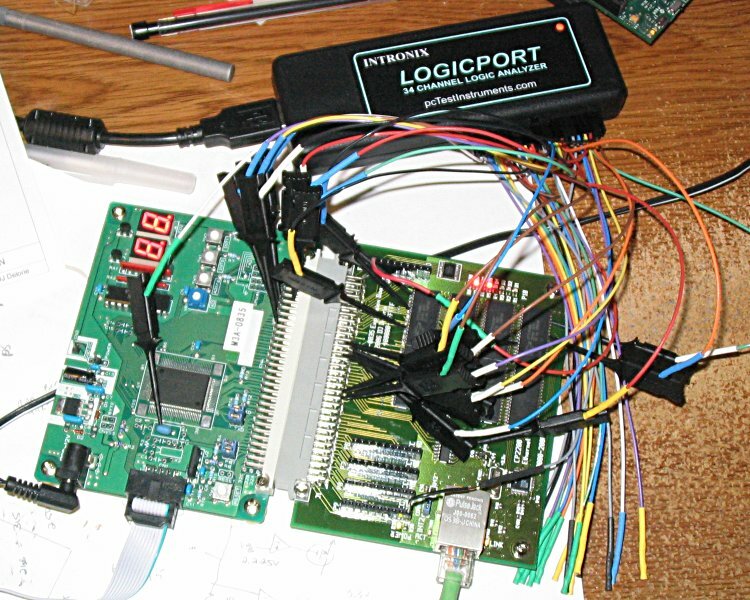 My expansion board is designed for microprocessor mode. The M32C/83 has 512K of flash and 24K of RAM on it. The board on the right is my expansion board. 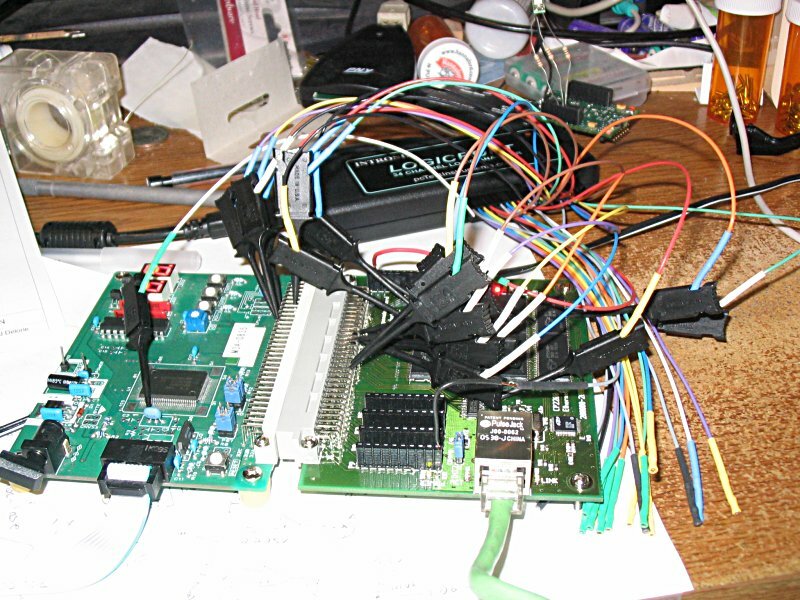 It adds 4Mb of fast SRAM (as eight 256Kx8 chips), five I/O connectors (solderless breadboard style, 22 gauge wire plugs into the sockets), a bank of 8 LEDs (on one of the I/O ports), and a CP2200-based 10baseT ethernet port. The board is double sided, with mostly 8 mil rules (a few 7.8 mil for the CP2200, which is 0.5mm pitch, and a few 6 mil clearances). The FAB was PCB-Pool, which has 6/6 rules. To satisfy the timing requirements of the SRAM (20nS) and CP2200 (140nS), the M32C is run at half its crystal speed (15MHz instead of 30MHz), with the SRAM at 0 wait states (33nS) and the CP3300 at two wait states (165nS). The M32C can't generate enough wait states to meet the 140nS timings at 30MHz, and if it could, it would need a wait state (45nS) for the SRAM anyway, which would be slower! 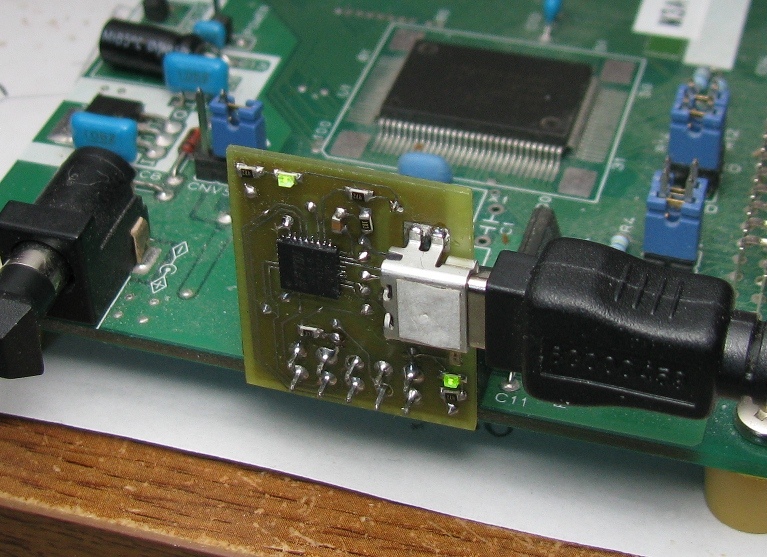 This is a USB to 10-pin adapter for this board. This lets me fully automate the programming and console of the board, without having to deal with jumpers or pressing reset. This uses an FT232RQ, which is a tiny QFN package. Pain to solder though - you have to reflow it since the connections are all on the bottom. It's also the first board with the new "short" usb connectors, but they seem to work out OK, I can still get my iron in to the leads. The three LEDs are: board power, USB power, and data. Despite the tiny chip, it's still 10/10 rules.